Conditional cash transfer programs (CCTPs) are widely used in the world and are proving effective in generating proven poverty alleviation impacts. However, CCTP achievements are undermined by fraud, errors, and corruption. These integrity risks and international experiences in managing them by using both state and civil society-led efforts have been analyzed in a paper prepared by PTF as a knowledge resource for Civil Society Organizations (CSOs) and government agencies involved in the implementation, monitoring and evaluation of the Conditional Cash Transfer Program (CCTP) in the Philippines. 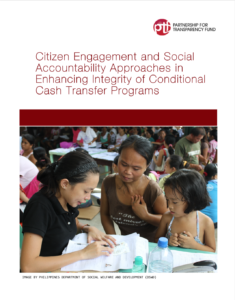 The paper has been prepared as part of “Guarding the Integrity of the Conditional Cash Transfer Program in the Philippines” (or iPantawid) being implemented by Filipino CSO, the Concerned Citizens of Abra for Good Government (CCAGG) and funded by the Global Partnership for Social Accountability (GPSA). The project’s objective is to develop a model for constructive engagement between government and civil society at the community level using social accountability initiatives for transparent and accountable implementation of the CCTP in the Philippines. The paper explores CCT programs and their accountability measures in several countries in Latin America, Africa and the Middle East, and the Philippines, as well as a field review of CCTP integrity systems in the Philippines in 2013. We found that fraud, errors, and corruption remain problematic despite state-led measures. There is a need, therefore, to complement state-led efforts to manage integrity risks within CCTPs with other mechanisms that directly engage beneficiaries of CCTPs and citizens more widely, including the use of social accountability approaches. With reference to the Pantawid Pamilyang Pilipino Program in particular, the paper’s findings suggest that integrity risk management is generally satisfactory for a program of this size and maturity but can be improved. Significant opportunities exist for CSOs to enhance the integrity and results like validating beneficiary lists, reporting on targeting errors, and assisting with recertification. CSOs can collect beneficiary feedback on access and quality of supply-side services in health or education programs, along with advocating and assuming co-responsibility for overcoming supply bottlenecks. CSOs may also improve their involvement in the Pantawid Pamilya program by broadening awareness and sustaining public and political support for it. It is recommended that CSOs and the Department of Social Welfare and Development (DSWD) analyze the social accountability initiatives in the Pantawid Pamilya program and develop a follow-up action plan.